To get to the shrine, you can take the JR Nara Line to Inari Station, a short 5-minute ride from Kyoto Station. When you arrive at the station, you immediately notice the vermillion painted columns all over the platform, to replicate the torii gates at the shrine. Walking over from the station and looking up at the mountain, it doesn't seem like such a difficult hike, but the trek will take you at least 2-3 hours. Even more, if you're like me and stop along the way to study every shrine and take a million pictures. To understand the significance this place, we must first understand a little bit about Shinto Shrines in general. A Shinto shrine is places of worship for Shintoist. It is also where the "kami" (Shinto gods) dwell. Inside these shrines are stored objects of worship for the kami. Since different gods have influence over specific parts of life, people will often go to a certain shrine to pray for good fortune in the area of expertise for that kami. These include childbirth, marriage, health and getting good grades at school. The Inari Kami, the god worshipped throughout the entire mountain and subsequent shrines, is the patron of businesses, merchants and manufacturers. For as long as there have been temples for the Inari Kami, people have come here to pray for success in their corporate endeavours. Early on after the temple's construction, worshippers would donate money to ensure their wishes were granted by getting good favour with the kami. To demonstrate their donations, a torii gate would be built with their name inscribed on it. Soon, hundreds of people wanted the same good fortune and came to this now infamous shrine to buy their own torii gates, creating the tunnel of torii gates you see today. Some say there are over 10,000 gates along the path but others claim that the number is well over 30,000. Many people wonder why the gates and temple are painted that very particular shade of vermillion. This colour is called “shuiro” in Japanese and is meant to represent the colour of the sun. The goddess Amaterasu, goddess of the sun, is the most important god in Shintoism and her name literally means "shining in heaven." Reflecting elements of her in the architecture of these shines brings them closer to heaven itself. The main shrine sits at the base of the mountain. Originally built on Inariyama hill in 711, it was moved to the base of the hill later one in 816 to protect it from earthquakes. The "honden" or main hall was built in 1499. It's golden ornaments glitter like sunshine against the bright red painted structure. The main temple is the location of the shrines most precious and sacred objects. Dragon fountains beside the temple are provided so visitor can wash their hands and cleanse themselves before stepping into the sacred space. Opposite the Hoden, is the "Haiden" or Offerings Hall. Here, visitors can come and make their prayers and offerings. You'll see hundreds of sacks of rice, sake, wine, beer and other consumer products. The owners of the companies who produce these items will often make a financial donation but also leave their products on display as a means of demonstrating their donation. Free promotion too for people will have respect for corporations who support their chosen Kami. In the main shrine, you'll see ema plaques with wishes written all over them. Alongside the hanging emas are hundreds and thousands of paper cranes. Paper cranes in Japan have a very powerful significance. A little girl whose parents were killed in the bombing of Hiroshima channelled her pain into the creation of these tiny, paper works of art. They were a symbol of her pain and giving them to the temple was an act of turning in her grief and stepping away from her suffering. These bright and colourful cranes are a symbol of people letting go of their grief and moving forward, to happier times. 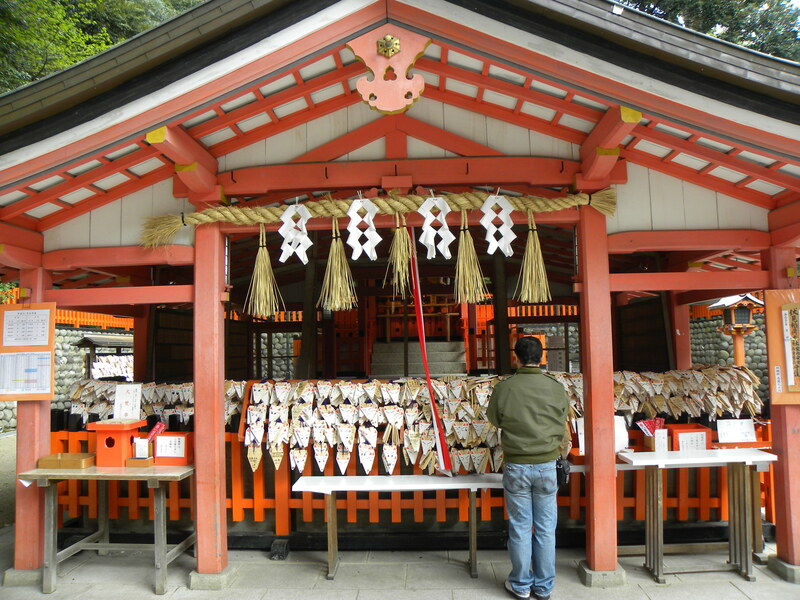 In the shrine, you'll also come across places to buy "Omikuji". 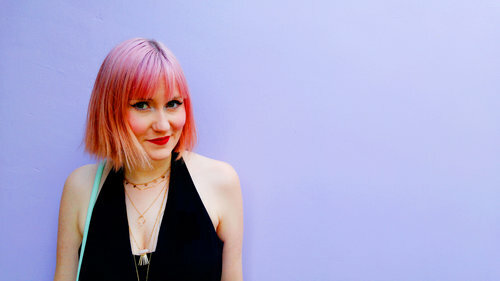 These are paper fortunes with predictions for your life written on them. But be warned, not all of them are good fortunes. If you receive a bad fortune, to counteract it, simply tie it onto the wire bands beside the shrine. This way, you leave the fortune behind. After wandering around the lower level temple, we headed for the stairs to begin our climb to the top! (_spoiler_ we didn't make it to the top...) At the back of the main shrine, you come upon two rows, side by side, of Senbon Torii ("thousands of torii gates"). No matter which path you take, they both will lead you to the inner shine in the middle of the mountain. There are said to over 10,000 torii gates lining the path, which creates a tunnel effect which you pass through. There are so many gates at some points that it completely obscures the forest around you. From the map, the trek didn't look so hard, but as we watched that tiny red point move only slightly after almost half an hour of climbing, we knew we weren't going to make it too far. 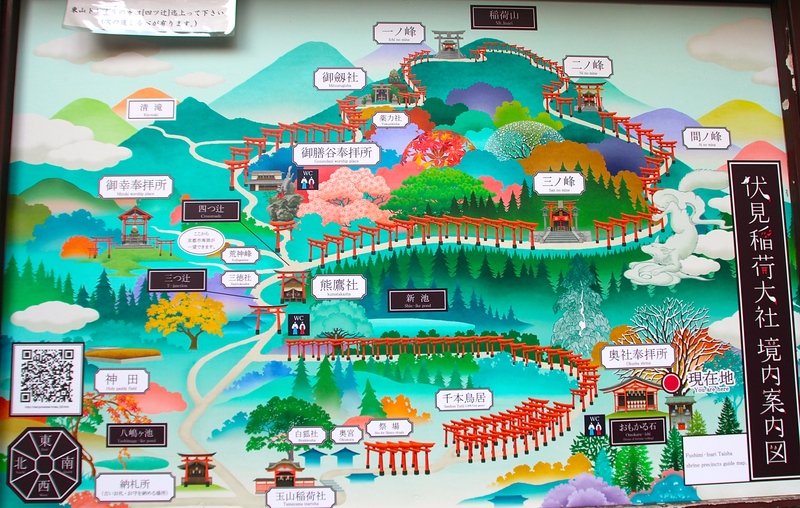 The smaller torii gates cost about 400,000 yen, and the larger ones can cost up to 1 million yen! They last about five years up here in the wilderness before they begin to deteriorate and need to be repainted or replaced. You'll see lots of "wet paint" signs along the path as there is always a dozen or so in the process of being repaired. When you first enter either side of the Torii gate trail, you'll see it is crammed with tourists. The effect of the gates might seem a little distorted when full of people but as you continue to walk, more and more people drop off, having had their fill, and suddenly you'll find yourself being the only one in these fields of bright orange wood. 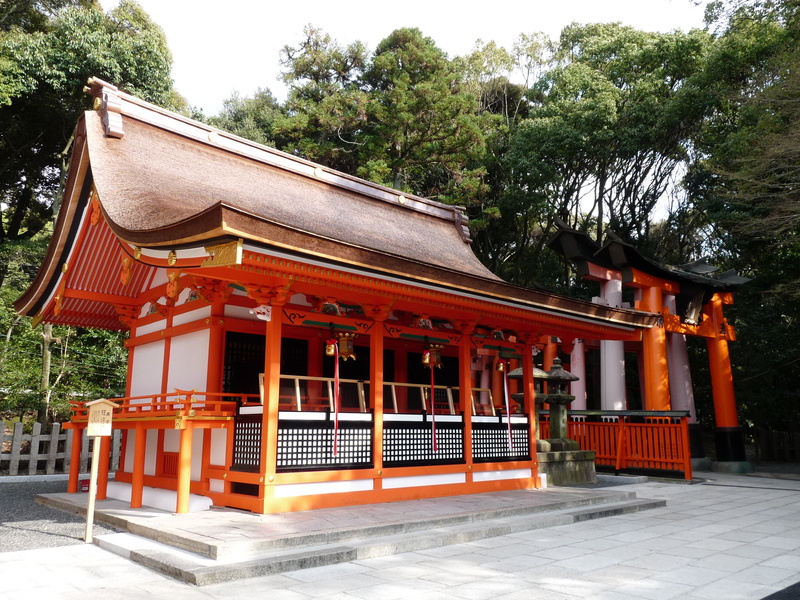 The first station you'll come to is "Okusha Hohaisho", the inner shrine of Fushimi Inari Taisha. This shrine was originally built for pilgrims who came and prayed to the mountain deities. The shrine was built in 1500 and has remained steadfastly the same throughout the years. The inner shrine was dedicated to the god of rice and sake by the Hata clan in the 8th century. Shintoists who come here to worship always follow a few rituals as they pray. The first thing they do is throw a coin into a box in front of the shrine and ring one of the suzu bells outside. These bells are thought to call the kami and let them know you're here. They are also believed to repel evil and imbue positive energy. Next, visitors will bow twice, quietly making their prayer to the kami, clap their hands twice and then bow deeply once more. Watching the deep concentration and devotion in their faces as made their prayers was a powerful and incredible thing to witness. Throughout the shrine and across the pathways, you begin to spot hundreds of stone foxes. Foxes are scared to the Japanese. They were thought to be messengers for the Inari, and they are the representatives of the gods here on earth. Often you'll see these foxes with different objects in their mouth. Each one of these items represents something significant for the gods. Keys represent the ability these foxes have to unlock a rice granary and bring forth sustenance. A scroll is meant to say the Fox is here to bring the recipient wisdom. A bamboo plant means a plentiful harvest and an orb symbolises spiritual power. In the inner shrine, you'll see ema in the shape of foxes where visitors can write their wishes and draw a face onto the ema, making it all the more personal. Each one of the faces a unique representation of the wish maker. There are also miniature torii gate emas that you can buy to write your prayers on. You might not have 40,000 yen, but you can still have a torii gate with your name on it. Dan ended up buying a green copper bell up here from a priest who blessed it with good luck and told him to ring it anytime he wanted to ask the gods for a favour. Beside the inner shrine, you'll also fine the "Omokaru Ishi". This is the site of the "light heavy stones". Here, you place a coin in the box, make a wish and then pick up a stone from the pile. If it's lighter than you thought it would be, your wish will be granted. After visiting the Omokaru-Ishi, you can continue on the pathway up the hill or take a short detour off the path to visit some of the sub-shrines located just to the south of Kumatakasha. The Kumatakasha is where you can get a great view of the tunnel of torii gates from outside of it. From afar you can more greatly appreciate how densely packed those gates really are. The temple you'll see right off this path is a very sweet little temple in the middle of a private bamboo forest. This site is the headquarters of the Inari shrines across Japan. 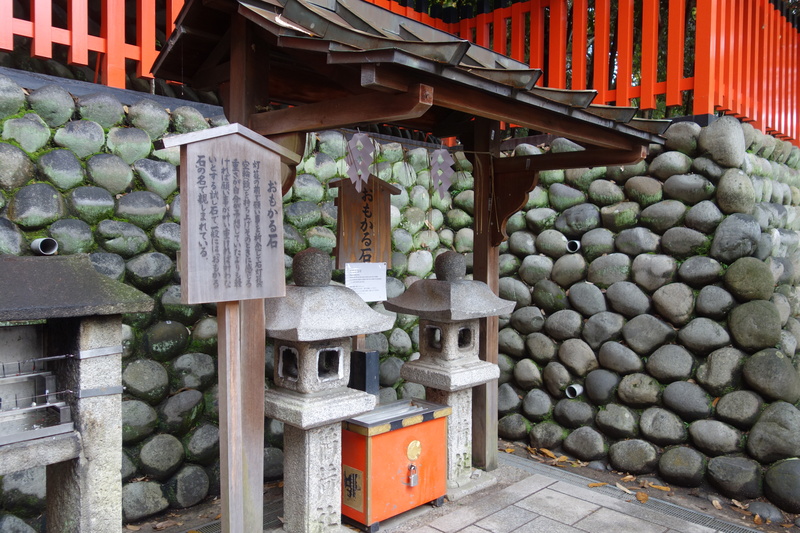 Every Inari shrine from across Japan is represented here via a small sub-shrine. Some no bigger than an apple basket. You could spend hours here looking at all the different sculptures and miniature shrines. There are said to be over 10,000 here, but we didn't come close to spotting that many. The large shrine here is marked with a "shimenawa" which is a straw rope with white zigzag paper strips along the top to marks the boundary between the physical realm and the sacred realm. There was a very kind priest in the shop beside the temple who tried to help explain what the colourful kimonos along the perimeter of the shrine were. Each one was a wish and with a small donation to the shrine, we decided to make one was well. Seeing as our next step in our life was to _hopefully_ get our own house, we wished for that. You were supposed to make the wish in elements of threes, so we went with, "health, happiness and home." After walking through the shrine garden, we headed out the back to explore the bamboo forest. There were no signs, or directions and not a soul had ventured in with us. Leaving a super crowded area and heading into an empty one certainly felt like we were breaking in somewhere we weren't supposed to be. We had visited the Arashiyama Bamboo Grove the day before and fought through hundreds of the people to view the forest. Here, we had our own private viewing garden. The bamboo might not have been as lush and tall but it was equally as beautiful. Hidden at the back of the forest is Fushimishinpo Shrine. Beside this shrine are hundreds of "O-Tsuka", stone monuments. These may look like tombstones, but they are a monument donated by Shintoists. People who believe in Inari gods will give them names, place the names of the stone monuments and leave them in places like these shrines. You come down a few steps to find a covered set of small shops and a few restaurants. Because these shops are only open during the busiest months, they were all closed when we arrived. 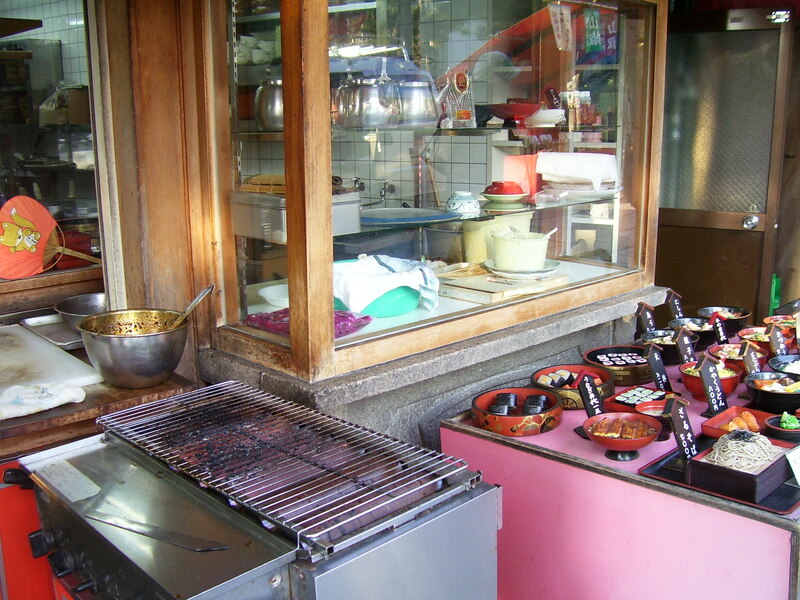 These restaurants feature locals street food like fried tofu, said to be a favourite food of foxes. We peeked inside a few of the shops and were surprised to find that some of the doors were left open. We got a little spooked out and hurriedly, headed back to where we could hear more than just the sound of our own voices. As you continue to hike up the path, you come across a large lake beside the Kumataka-sha shrine. This is the Shrine of the Mountain Hawk-Eagle. Along the lake, above the shrine, there are a few small tea shops (which again were closed while we visited) but there are also a few vending machines here where you could buy various overpriced bottles of water, soda or coffee. Legend has it that if you face the lake and clap your hands, you will hear an echo come back to you. Listen carefully for which direction the echo returns as it says that if you follow in that direction, it will lead you to someone who has lost their way. After the lake, you'll see the pathways become almost empty. People have all but given up on the journey and yet here you're barely halfway up. Before the first lookout point, I ran into a man feeding cats at the top of the hill. As he brought out the food, dozens of cats emerged from the forest. It was a haunting image to see when you're walking through this forest all alone. At about the halfway mark along the path, you'll come upon Yotsu-tsuji. 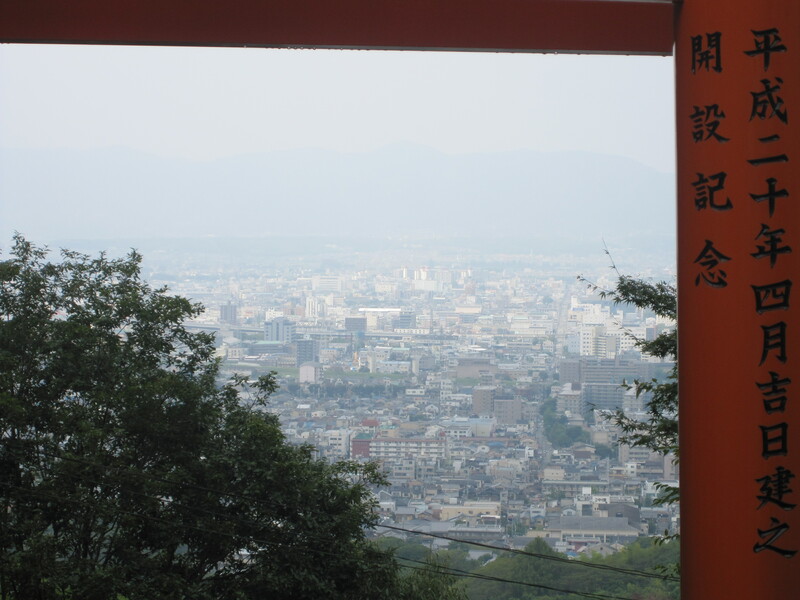 This small shrine has an incredible view of Kyoto below and the trail of torii gates. At the summit of Inariyama Mountain (which admittedly I did not make it up to), you'll finally come to the Kami-no-Yashiro shrine, 233 meters above sea level. Up at the top shrine, you'll find omikuji fortunes which are notorious for being extremely accurate - for some people, it is the entire reason they make the hike up to the summit. The walk back down the hill is a much easier journey. You can choose to descend on the opposite side you came up so you have some different things to look at. Dusk was settling on the mountain, and our stomachs were grumbling. At night, many of the pathways are lit up, and the tourists have significantly dwindled. We wish we could have stayed longer and see the trail when it is all aglow but we were exhausted from our journey and decided to head home. As we left, we ran into a few women in their finest kimonos leaving the temple. It was magic hour and seeing these alluring dresses as the sun began to set was one of that one-of-a-kind moments. As you leave the shrine and head back to the station, you pass some sweet shops. The most famous treat being sold here is the "tsujiura senbei", a fortune cookie from the 19th century. Snack carts sold a myriad of street food, infusing the entire lane with sweet and savory smells. Roasted dango was another popular dish found all over the streets here. It was being uniquely prepared as the dango rested around hot coals in the centre of an urn where they are slowly turned to give them an even charr. Fushimi Inari-taisha is truly one of the man-made wonders of the world. Finding time to come here and make the entire journey is highly recommended. The best time to come is early in the morning or as the sun sets at night since the crowds are the lowest and the light is stunning. Although we did find that even with heavy crowds, the further you get up the mountain the less and less people there are around you. So put in the effort and you'll be rewarded with the most incredible sites.